Well into their golden years, Lowell and Sarah make regular trips to Eagle Butte, South Dakota. 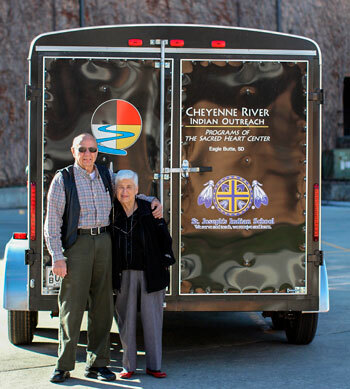 Trailer in tow, they deliver much-needed supplies to Cheyenne River Indian Outreach, helping women and children fleeing from domestic violence. After she passed away, Lowell and Sarah were inspired to carry on her tradition. The pair began watching yard sales and keeping a sharp eye out for things like toasters, towels and coffeemakers. “We sent a few things by mail, but it was so expensive to ship!” said Sarah. That’s when they decided to get a trailer. With the help of their church family, the trailer began to fill up. Gently used clothing, books, blankets and more were left on their doorstep, waiting to make the trip to South Dakota. Local hotels donated towels and linens. Families picked up extra school supplies while they were on sale. Staff at the thrift store set aside a “South Dakota bag,” reserved for items they knew were especially needed and hard to come by. “We’re so grateful to have our community involved!” said Sarah. So important is their twice-annual trip to Cheyenne River Indian Outreach, that Lowell and Sarah spend their spare time working up to four different jobs to make sure they have the extra money needed to pay for gas and a hotel along the way. It’s worth it, they both agree.